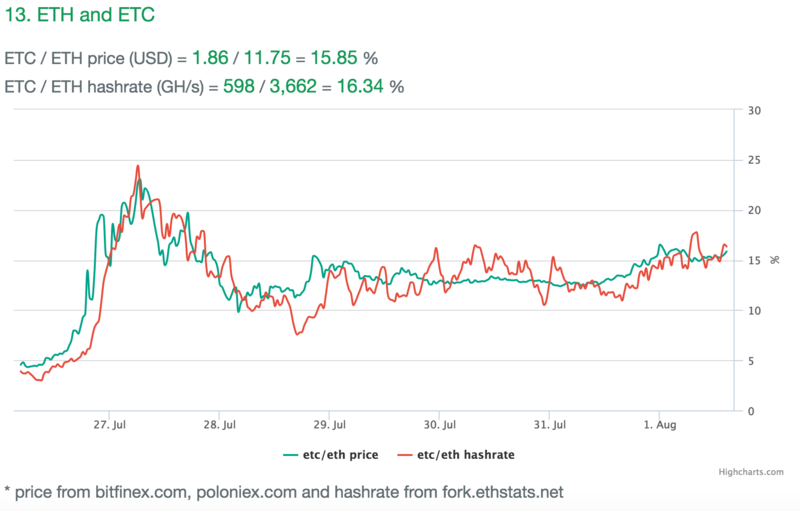 The value of ETC is best viewed as a percentage of the market value of ETH. ETH Stats publishes a must watch chart that compares the price and hash power of ETH vs. ETC. The more hashing power that ETC has relative to ETH, the more valuable ETC will become. Miners will mine ETC for two reasons. One, it will at times be more profitable to mine ETC than ETH. Two, they want to broadcast their disagreement with the hard-fork. Many regular users and traders will contribute a small amount of hashing power to support the idea of immutable code that ETC represents. Enough of these small actors can and will make a difference. Last week, I recommended buying ETC vs. selling ETH using BitMEX products. That trade performed well, as ETC has climbed from 5% to over 25% of ETH’s value (a 5x return). The longer that ETC is in existence, the stronger it will become. However, the longer that ETC exists the more incentive the Foundation has to attempt to torpedo the coin. In the January Ethereum Foundation Internal Update, the Foundation stated they held 2.25 million ETH. They now hold an equivalent balance of ETC (worth 10,000 XBT). Given that Poloniex traded almost 89,000 XBT worth of ETC in the last 24 hours, any attempt by the Foundation to dump ETC into the open market will have only a momentary effect. The DAO attacker has access to 3.6 million ETC, which is approximately 16,000 XBT. They can now freely move his ETC out of the DAO and cash out. They will not attempt to crush ETC because that hurts how much money their caper nets. If we assume the attacker wants to maximise their earnings, either they will sell a small amount of ETC each day for Bitcoin, or ride the wave hoping for greater ETC capital appreciation. Some miners and mining pools voiced designs to take down ETC via a 51% attack. If they have enough of the ETC hash power, they have the ability to write and rewrite history as they please. If successful, they could render ETC worthless. Most miners are more motivated by profit than scoring ideological points. They invested millions of USD into their equipment. Unless the Foundation is financially backing a mining pool (I doubt the Foundation has the financial resources to do this), the pool will have a hard time convincing people to step up and burn their money so that ETC dies. If you believe in the success of ETH, then you implicitly believe in the success of ETC. They both can co-exist peacefully. ETH is for financial institutions and large companies who value some modicum of centralisation and control. ETC is for those who want to build truly disruptive decentralised applications. For those who held ETH pre-fork, the sum of the parts is usually greater than the whole in financial markets.